With the country facing a severe air pollution challenge and the automotive industry being handed over the task to move towards sustainable mobility solutions as one of the countermeasures, discarding generation-old cars, two-wheelers and buses remains an onerous task with no concrete law or policy in place for end-of-life-vehicles (ELVs). With the government proposing a VVMP (voluntary vehicle fleet modernisation programme) back in 2016 in the form of a draft policy, there has been no formulation of proper regulations as to how these decade-and-a-half old vehicles will be cremated to death. According to government estimates, over 28 million ELVs (older than March 31, 2005) across categories will be ready to be discarded by April 2020. Apex industry body SIAM, in association with the Ministry of Environment, Forest and Climate Change (MoEF and CC) - Government of India, and ACMA, organised a day-long conference in New Delhi to discuss and debate on sustainable material management and environmentally safe disposals, on March 17. The conference, a first-of-its-kind initiative, focussed on sustainable management of materials (international material data system - IMDS), tracking of hazardous chemicals, heavy metals and Persistent Organic Pollutants (POPs), and discussed how to minimise their negative effects on the environment and human health. SIAM says that the data provided on the above will facilitate the automotive sector, regulatory agencies, R&D institutions and ministries to engage in further discussions, negotiations and actions under the Rotterdam and Stockholm Conventions, for which MoEF & CC is a nodal agency. “There should also be a control on the number of unused vehicles. There are 35 million vehicles plying on roads that have already exceeded the age of 15 years and manufacturers must start using materials that are reusable, the government should announce the ELV policy at the earliest and the ministry must notify AIS 129 standards immediately,” she added. The day-long conference also saw detailed technical sessions with industry and regulatory experts projecting the current scenario and the way forward, while also showcasing learnings from other economies. 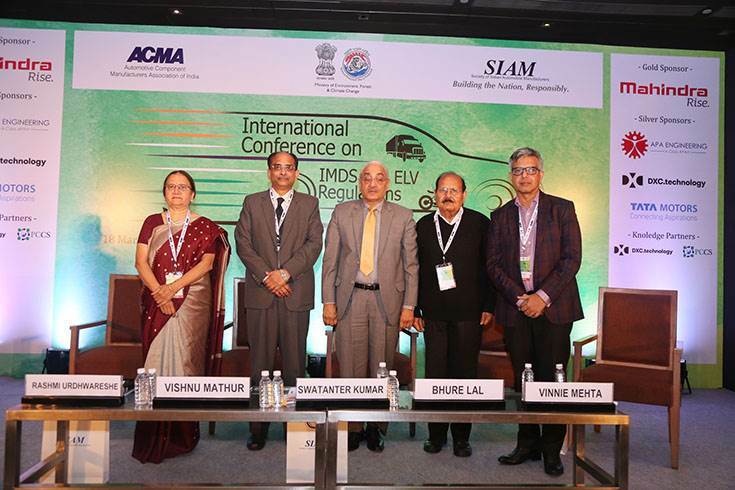 According to Dr A N Vaidya, NEERI, who spoke in detail about the implementation and challenges of international obligations in the recovery and recycling of hazardous chemicals in the automotive sector, “Automotive industry deals with many regulations. We need to recognise the adverse impact of chemicals on the environment and human health, and take feasible actions to combat it. The aim is to have international integrations in the recovery and recycling of chemicals in the automotive sector.” He further spoke on how international regulations function under different annexures. Interestingly, while the government is accelerating its electric mobility drive and is also skipping an entire generation of emission norms to leapfrog to BS VI in the country, both of which direct towards its consciousness towards the environment, a large portion of the existing commercial vehicle fleet, both passenger and goods carriers, comprises old vehicles which are running on extended life. However, with general elections to be held in a couple of months, it does not look like the government will clear a vehicle scrappage policy soon, given that it could impact a large number of enterprises and transporters across the country.